My skirt skirt was lined with polyester lining and the hem uses 1" horsehair. EMBROIDERED TABARD - The skirt has an oval shaped tabard that attaches to the waist of the skirt. It is embellished with elaborate corded embroidery or passementerie type work that was reportedly done with a cornely embroidery machine. Since I do not have an cornely (cornelly) embroidery machine or the knowlege or skill to use one, I was able to replicate this look by hand couching rayon bourdon cording. PATTERN USED - McCall's 3449 Bridal Skirt (I think it's discontinued). I chose this pattern because it was not gathered in the front. The Yoke of the skirt was altered to remove the V. I chose to wear a farthingale under my skirt. 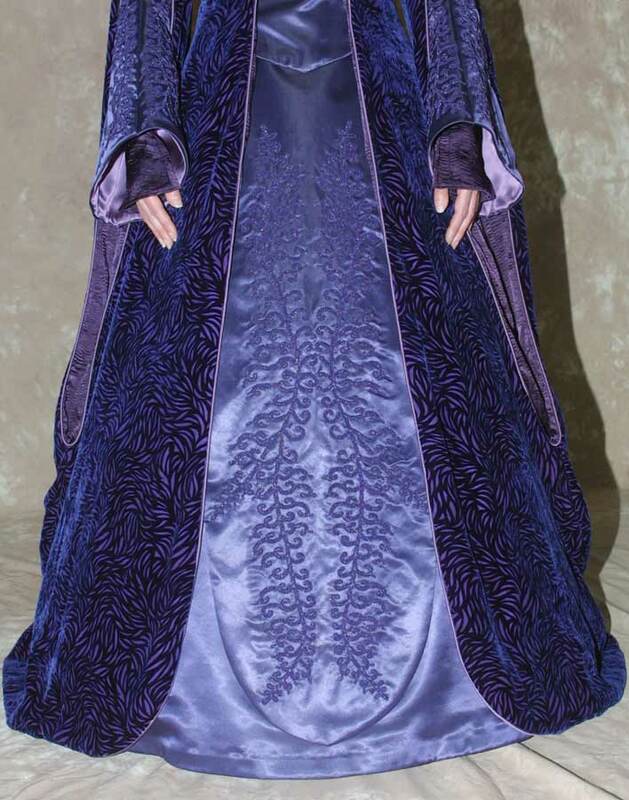 However, Padme might be wearing a ruffled petticoat similar to that worn under bridal gowns. 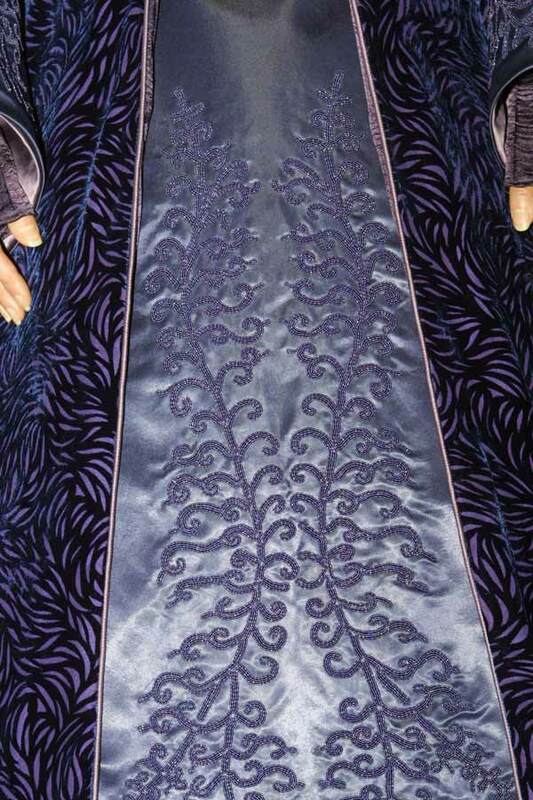 The Embroidery design on the costume worn in the movie uses double strands of cording coverd with a satin stitch. 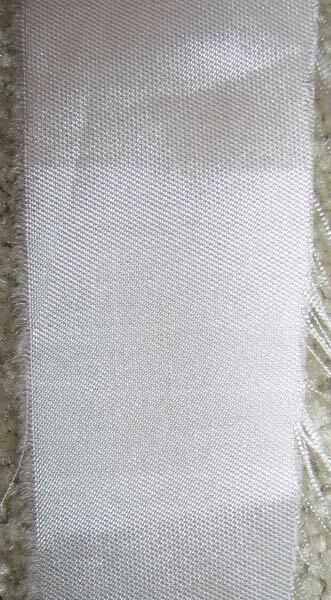 The thread has a sheen like a rayon or viscose embroidery thread. A second metallic thread is worked into the machine embroidery to give it sparkle. 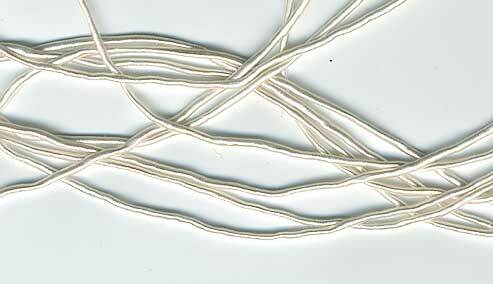 But the metallic thread is used less densly than the rayon thread. I was unable to determine if the metallic thread in is silver or purple. 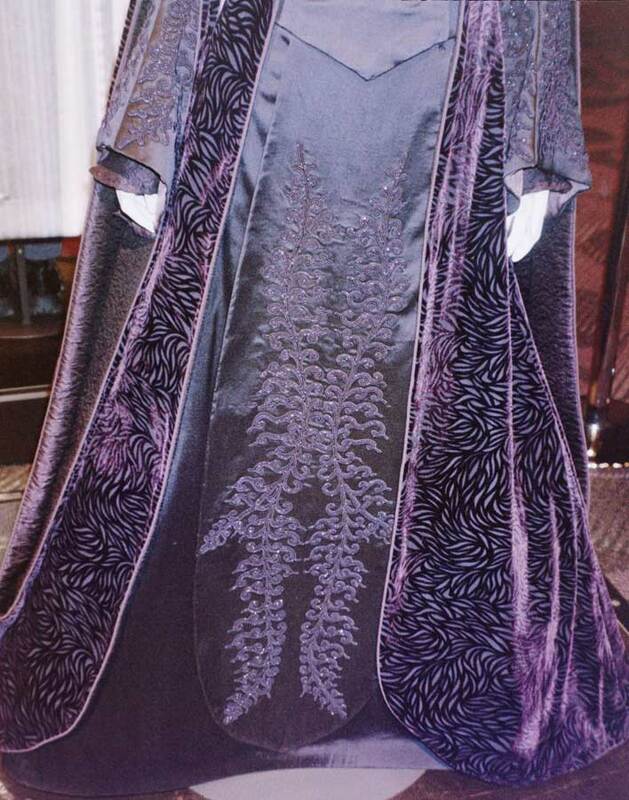 According to the book "Dressing A Galaxy," the kind of embroidery done on Padme's costumes is Cornely Work. This sample of Cornely Work was on the touch wall at the FIDM Exhibit. 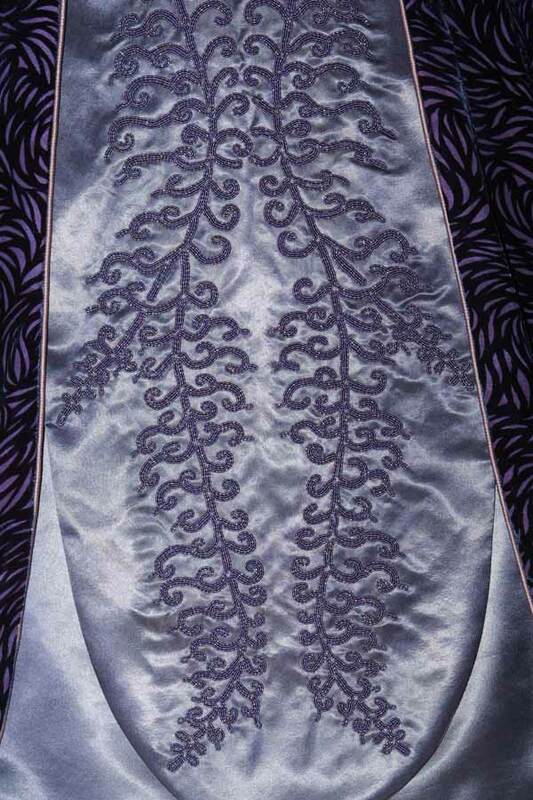 MY EMBROIDERY NOTES: I don't have a cornely embroidery machine, so the next best way to replicate this look is by hand couching rayon bourdon cording. I spent several hundred hours embroidering the tabard, sleeves and bodice of my costume. 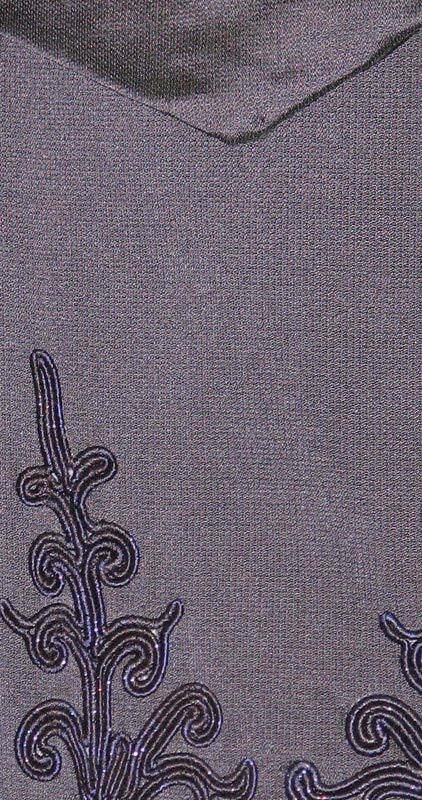 Rayon bourdon cording size #6 (purchased from Lacis) was hand embroidered to the tabard fabric using a couching stitch. The Bourdon cord came in 50 yard bundles and was dyed purple with procion fiber reactive dyes purchased from Dharma Trading. A combination of Ultra Violet and Midnight blue matched my fabric fairly well (see dye notes below). 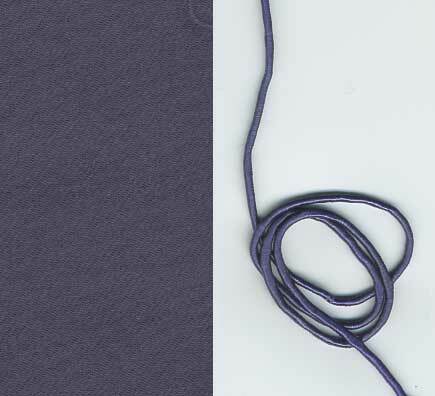 The cording was stitched on with Kreinik Metallic Cord in purple (012C 50M). The beginning and ends of the cording were sealed with fray check and these ends met one another once the entire loop of embroidery was complete. About 60 total yards of bourdon cording were used for this tabard. WHAT WORKED WELL: Four separate bundles of cording were used to keep a continuous, unbroken pattern of cording as I embroidered (each bundle contained 50 yards. About 15 yards from each bundle were used). Keeping the bundles in small ziplock sandwich bags helped keep them from getting tangled with one another. The pattern (which was traced from enlarged photos, fine tuned in adobe illustrator, and printed on clear overhead projector film) was transferred onto the fabric directly with white wax free transfer paper. In order to keep the fabric clean while I handled it in the hoop, I eventually came up with a technique of laying a piece of light weight Solvy Stabilizer on top of the fabric and cutting out a hole that left a free space to embroider on my design (See hoop below). When I later embroidered the sleeves, I simply used saran wrap to cover my fabric instead of the expensive solvy. I used the dye at half the concentration called for in the instructions provided by Dharma. All other proportions of salt, water, and soda ash were kept the same as the instructions called for. Only the amount of dye was reduced by 50%.